It's exactly 150 years since the picture considered in this post was published in the 'General Mor­pho­lo­gy of Or­gan­isms' by Ernst Haeckel (1866). "Phylogeny is the evolutionary history of or­gan­isms," explains Uwe Hoßfeld, co-author of a recent paper in Nature that celebrates this an­ni­ver­sa­ry. "Because Haeckel was the first actually to define this term, in that same work, he was also the only person capable of representing the first tree of life of this kind." But before you start feeling all too comfortable within the beautifully drawn twigs and branches of Haeckel's tree I should bet­ter men­tion its four minor flaws, and one more fundamental flaw in particular (see Figure). 1. You notice Homo sapiens right on top in the figure. 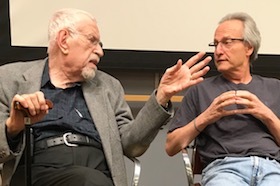 To­day, biologists have no reasonable indication for an evo­lu­tionary masterplan that would, by necessity, lead from 'primitive' unicellular organisms to multicellular or­gan­isms capable of pondering, for example, how life evolved. Yet, seven years after Charles Darwin's 'On the Origin of Species', it was still outright scandalous to pro­pose that the crown & glory of creation (I'm referring to Genesis 1:26-31 here) is a member of the primates. De­nying Ho­mo sapiens the top position in the Tree of Life would have been perceived as a double humiliation then, and Haeckel avoided this probably as a concession to Zeit­geist. That he did not deem a prominent position i­n the Tree of Life necessary for H. sapiens can be safely de­du­ced from his alternative depiction of the tree com­pri­sing Planta, Protista, and Animalia on equal levels (also from 1866). 2. Did you notice that the Tree of Live Life is devoid of foliage? In winter time, this is the common phenotype of oak trees (Quercus robur L) as Haeckel might have seen them aplenty in Jena, Germany. Intuitively, one would rather think of extant spe­cies as the leaves on the branches of the Tree of Life. But Darwin also ignores the leaves: "The green and budding twigs may represent existing species; and those produced during former years may represent the long succession of extinct species" ('On the Origin of Species', 1st Ed., Chapter IV., 'Natural Selection', p. 129). Maybe Darwin implicitly thought of existing individuals as the lea­ves on the 'species twigs' but we can only guess what led Haeckel to omit the leaves. Maybe for the more trivial reason that foliage usually hides the branches of a tree from becoming visible at a distance (and proudly making all the drawings himself, Haeckel would have had problems with the numerous name tags for all the taxa, too). 3. You see Monera – prokaryotes in modern terms – and Amoebae (protists) lumped together at the unstructured base of the tree's stem. This is understandable given the (almost) complete lack of insight into the world of the small things in Haeckel's time. But the base of the tree drawn with the immense diversity of unicellular life that we know now exists in mind would easily span two or more full pages, making the 'tree' simile appear, hm..., ridiculous. 4. The hierarchical order of the branches in Haeckel's tree implies a timely order of taxa evolving from their ancestors. An explicit time scale is not given but all branches above the Mone­ra/Amoe­bae stem roughly reflect the unfolding of life forms – in this tree here only Animalia, but Haeckel's more complete tree also includes the Protista and Planta – since the Cambrian explosion. This is comparable to setting the beginning of human history on exactly October 12, 1492, Columbus' ar­rival in the Americas. Given these latter two 'distortions' of scales in Haeckel's tree I wonder whether any biologist today would think of a tree as a suitable simile for Life on Earth in the first place. But there is one more caveat for using the Tree of Life metaphor. In a living tree, metabolites flow through its phloem, from the roots up to the tiniest branches, the twigs and the leaves, and back. Thus, Haeckel's organismal phylogenetic tree insinuates a material connection between the Mo­ne­ra and H. sapiens, as species and as members of these species, individual organisms. However, all our ancestors are dead. And all ancestors of all other living organisms are... dead, decomposed, fossilized (maybe). Even bacteria do not thrive and divide on end, as it has been shown for Cau­lo­bac­ter: individual cells eventually cease dividing after some 120 generations and finally die. There is no way to rescue the failing 'tree' metaphor. Charles Darwin thought, for some time, about the 'Coral of Life' as a suitable simile. In corals, budding polyps sit on top of the dead and mineralized skeletons of their parents. There is no other material connection than these skeletons, no flow of metabolites between the polyps on different branches of the coral stem. Regrettably, Charles Dar­win skipped this idea in favor of the Tree of Life, probably because corals were just too exotic for 19th century Britons. For fairness, Haeckel's Tree of Life should not be compared to mod­ern "trees" (you can easily try to 'build' one yourself here ). His tree is explicitly meant as an organismal tree while all modern ver­sions, starting with the 3-Domain-Tree by Carl Woese, are 'gene trees' (despite being often cal­led 'Tree of Life' ). The only "flow" between successive generations that we really know of is that of the information contained in the genetic material – and it is unidirectional, Descent with mo­di­fi­ca­tion (Darwin) – but this does not allow for a straightforward organismal phylogeny 1). In such mod­ern "trees", individual genes (ribosomal RNA), genomes, or concatenated protein sequences are used as proxy for an organism, and the "branching" is calculated by intricate algorithms that as­sess the degree of relatedness among sequences of the respective data sets. This approach is as far as it can get from any metaphoric 'tree'. Besides, high degree of horizontal gene transfer (HGT) – especially but not exclusively among Prokaryotes – has led researchers into an almost im­per­vi­ous thicket. 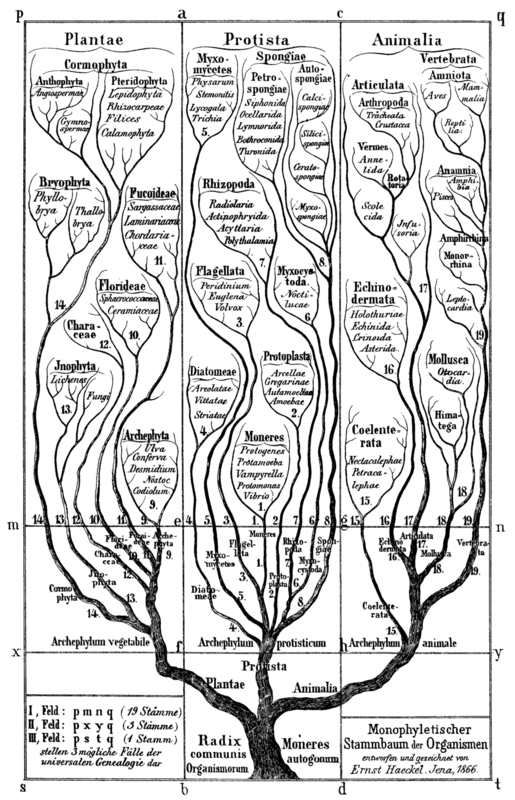 So, today biology is probably farther away from an organismal Tree of Life than at Darwin's and Haeckel's time. We just have more data. 1) tackling organismal phylogeny would require solving the mantra Omnis cellula e cellula (Virchow, 1855), or its more modern paraphrase Omnis membrana ex membrana (Blobel, 1999). Briefly: we know (probably) all the genes encoding the proteins that make the building blocks for cell membranes, we know the pathways for how these building blocks get incorporated into existing membranes to make them grow. But this toolkit does not allow us to get de novo membrane synthesis going: always a pre-existing membrane is necessary, think of the Mycoplasma genome transplant by the Craig Venter lab.